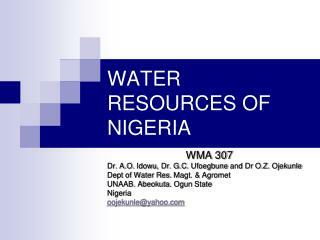 WATER RESOURCES OF NIGERIA. WMA 307 Dr. A.O. Idowu , Dr. G.C. Ufoegbune and Dr O.Z. Ojekunle Dept of Water Res. Magt . & Agromet UNAAB. Abeokuta. Ogun State Nigeria oojekunle@yahoo.com. Rainfall; Pattern, spread and quantity. Daily, monthly and yearly rainfall in different regions of the country. 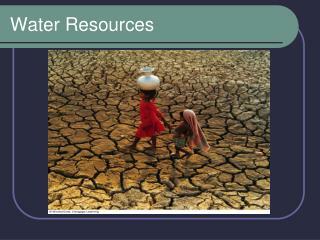 Climate and Water Resources of Nigeria: Factors affecting precipitation in Nigeria. 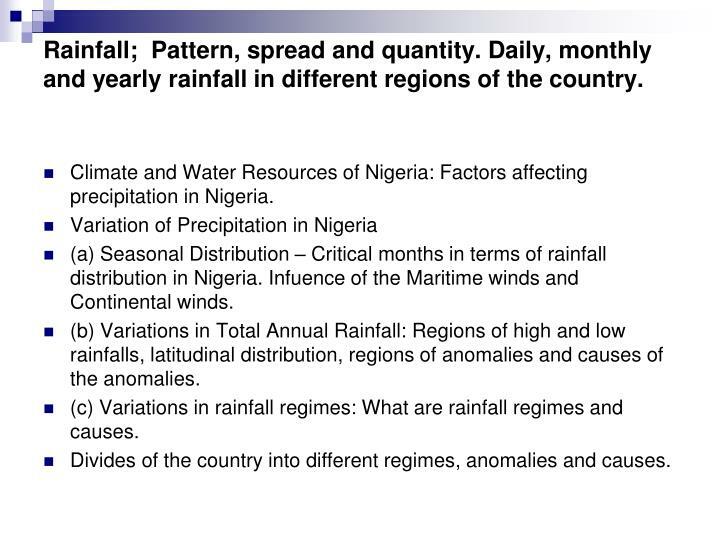 (a) Seasonal Distribution – Critical months in terms of rainfall distribution in Nigeria. Infuence of the Maritime winds and Continental winds. (b) Variations in Total Annual Rainfall: Regions of high and low rainfalls, latitudinal distribution, regions of anomalies and causes of the anomalies. (c) Variations in rainfall regimes: What are rainfall regimes and causes. Divides of the country into different regimes, anomalies and causes. 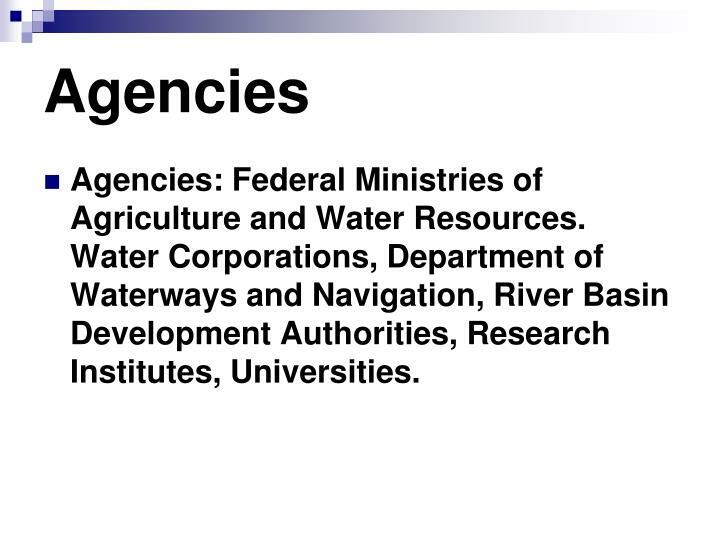 Agencies: Federal Ministries of Agriculture and Water Resources. 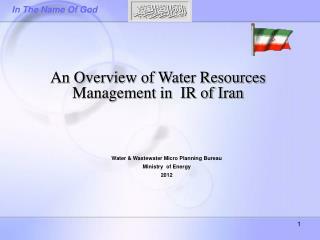 Water Corporations, Department of Waterways and Navigation, River Basin Development Authorities, Research Institutes, Universities. 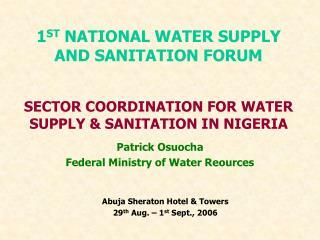 The Federal Government – The ministry of Water Resources. 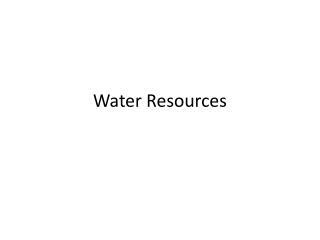 Sectors of the Minstry- Hydrology and Hydrogeology Division, Dams and Reservoir operations and Waste water and environmental sanitation. 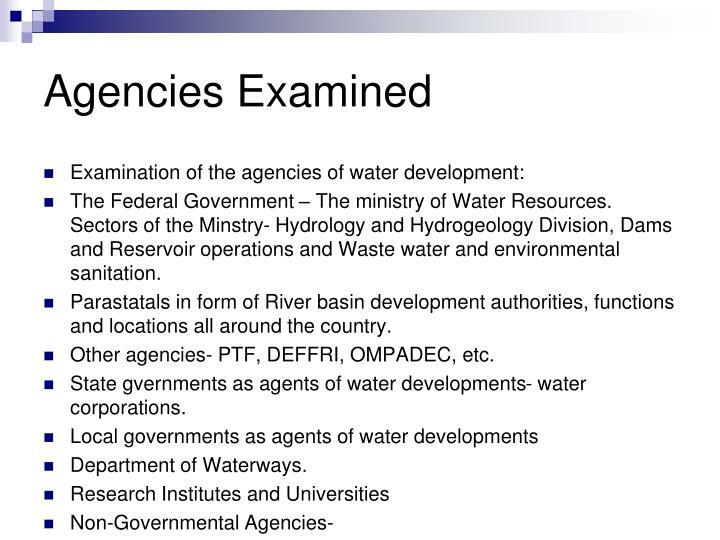 Parastatals in form of River basin development authorities, functions and locations all around the country. Other agencies- PTF, DEFFRI, OMPADEC, etc. 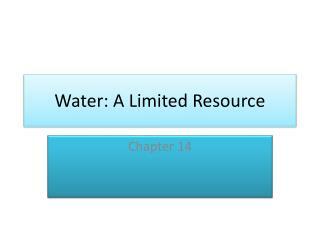 State gvernments as agents of water developments- water corporations. 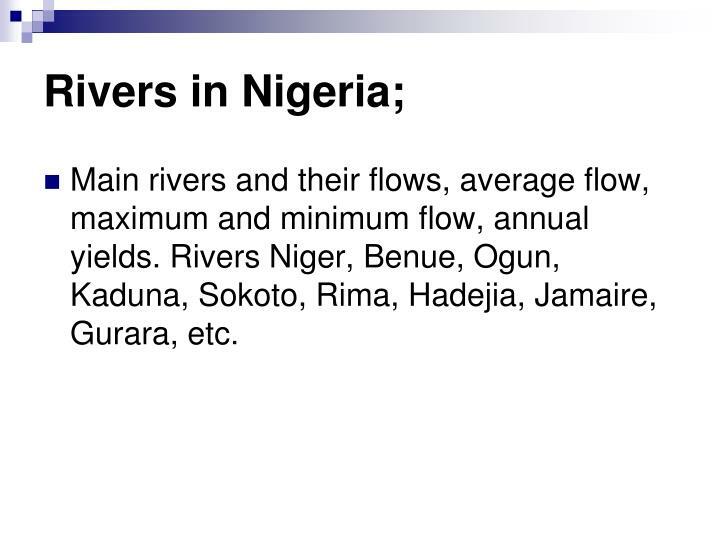 Main rivers and their flows, average flow, maximum and minimum flow, annual yields. 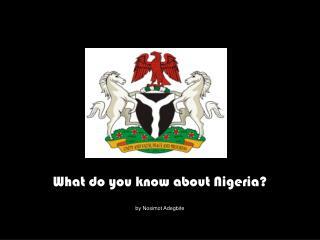 Rivers Niger, Benue, Ogun, Kaduna, Sokoto, Rima, Hadejia, Jamaire, Gurara, etc. Natural and artificial lakes. Reservoirs above dam – Kainji, Jebba, Tiga dams and reservoirs etc. 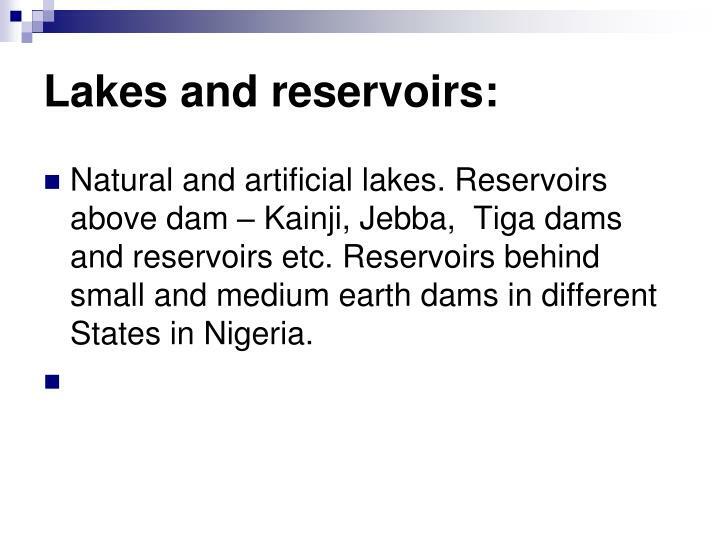 Reservoirs behind small and medium earth dams in different States in Nigeria. 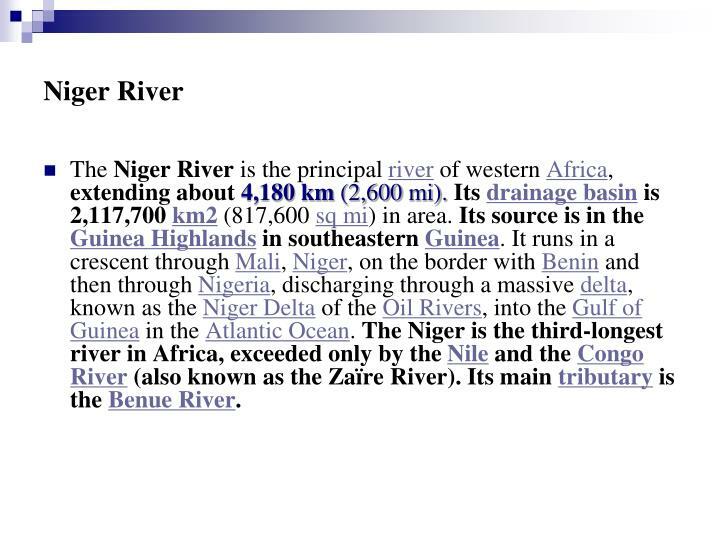 The Niger River is the principal river of western Africa, extending about 4,180 km (2,600 mi).Its drainage basin is 2,117,700 km2 (817,600 sq mi) in area. Its source is in the Guinea Highlands in southeastern Guinea. 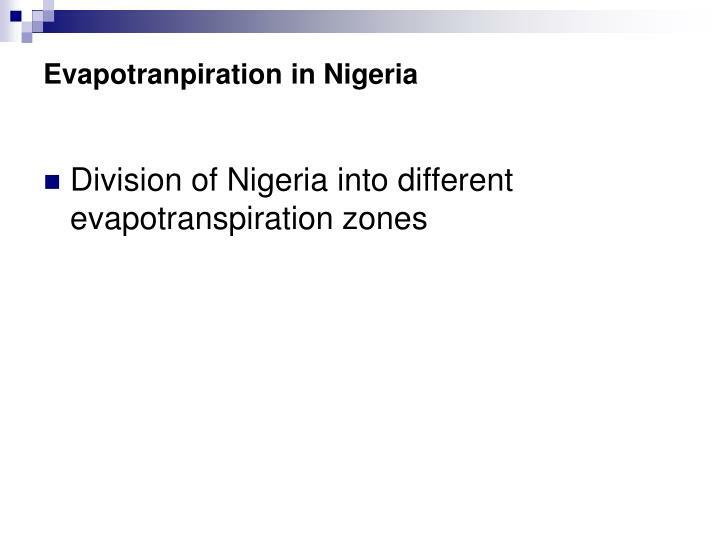 It runs in a crescent through Mali, Niger, on the border with Benin and then through Nigeria, discharging through a massive delta, known as the Niger Delta of the Oil Rivers, into the Gulf of Guinea in the Atlantic Ocean. The Niger is the third-longest river in Africa, exceeded only by the Nile and the Congo River (also known as the Zaïre River). 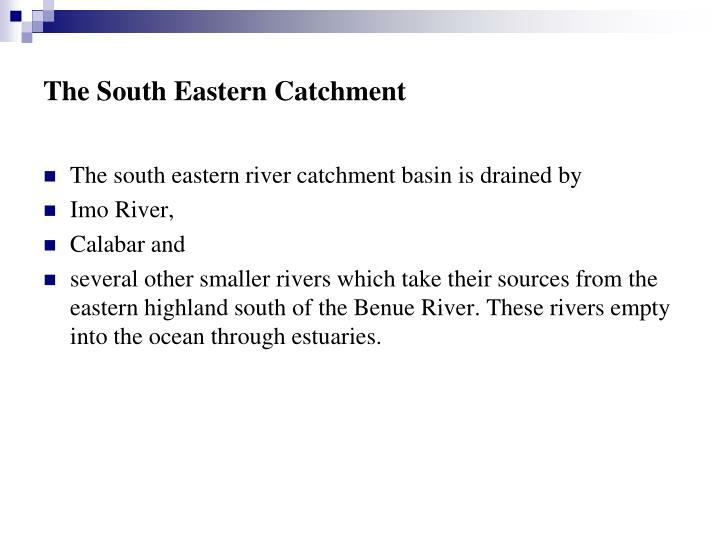 Its main tributary is the Benue River. 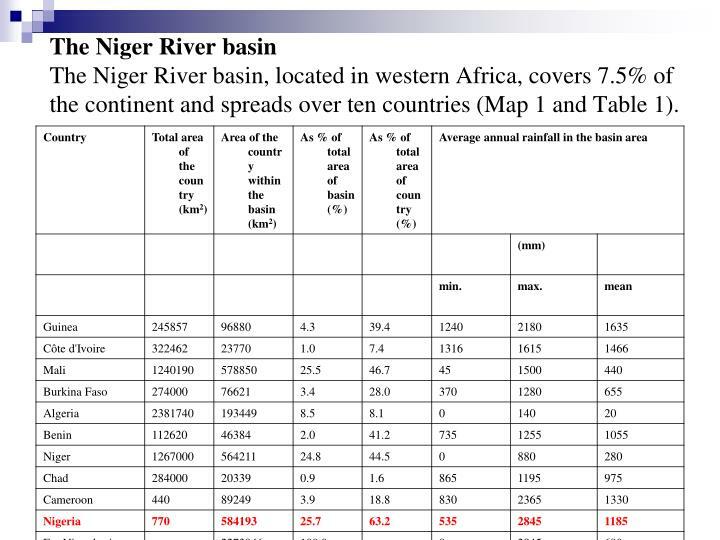 The Niger River basinThe Niger River basin, located in western Africa, covers 7.5% of the continent and spreads over ten countries (Map 1 and Table 1). 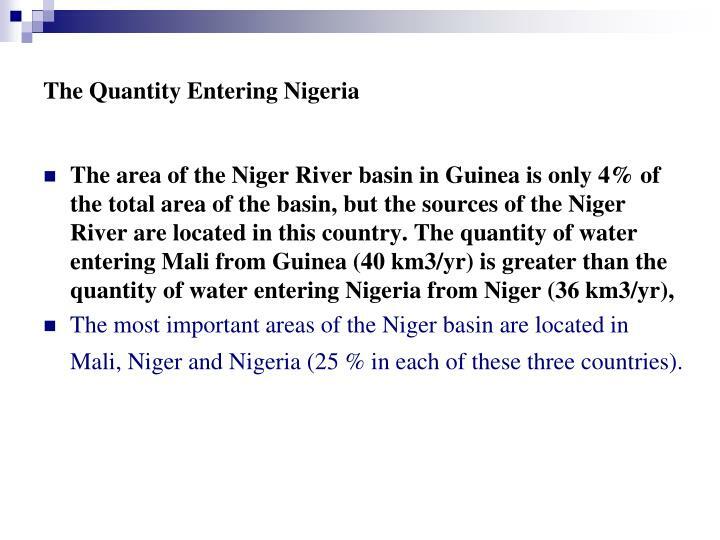 The most important areas of the Niger basin are located in Mali, Niger and Nigeria (25 % in each of these three countries). 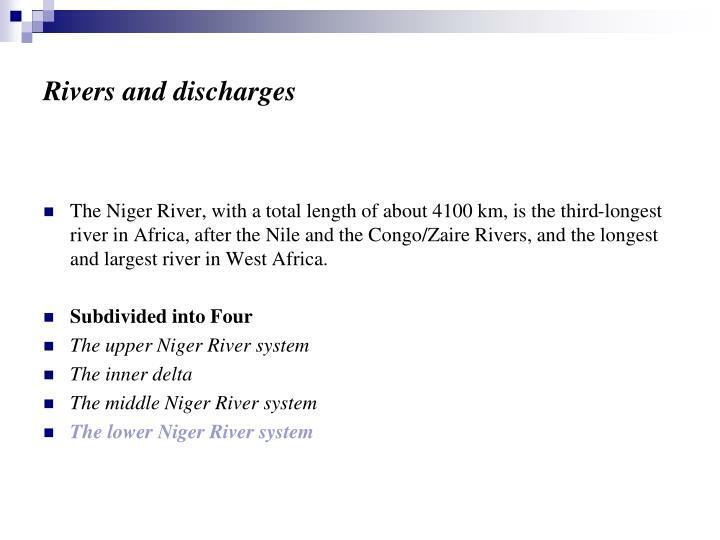 The Niger River, with a total length of about 4100 km, is the third-longest river in Africa, after the Nile and the Congo/Zaire Rivers, and the longest and largest river in West Africa. Leaving the border between Niger and Benin the river enters Nigeria, where it is joined by numerous tributaries. 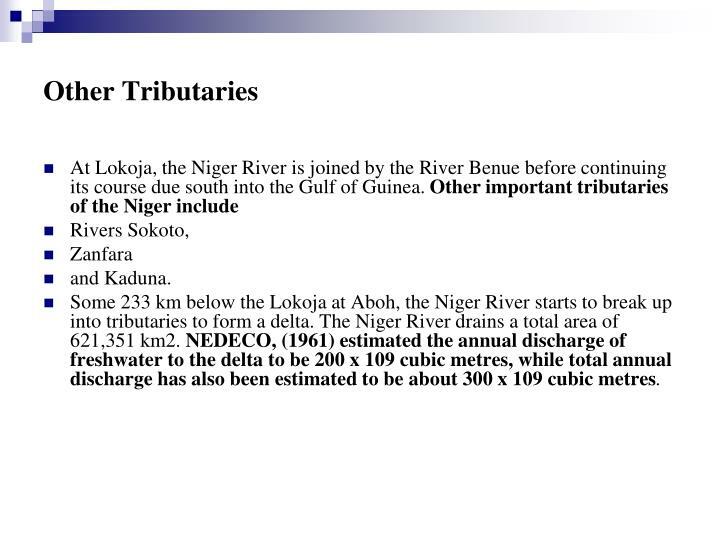 The most important tributary of the Niger is the Benue which merges with the river at Lokoja in Nigeria.The quantity of water entering Nigeria was estimated at 25 km3/year before the 1980s and at 13.5 km3/year during the 1980s. In Nigeria itself the Benue is joined by several tributaries, of which the ones at the left side originate mainly in Cameroon. Reaches its lowest level in March and April. 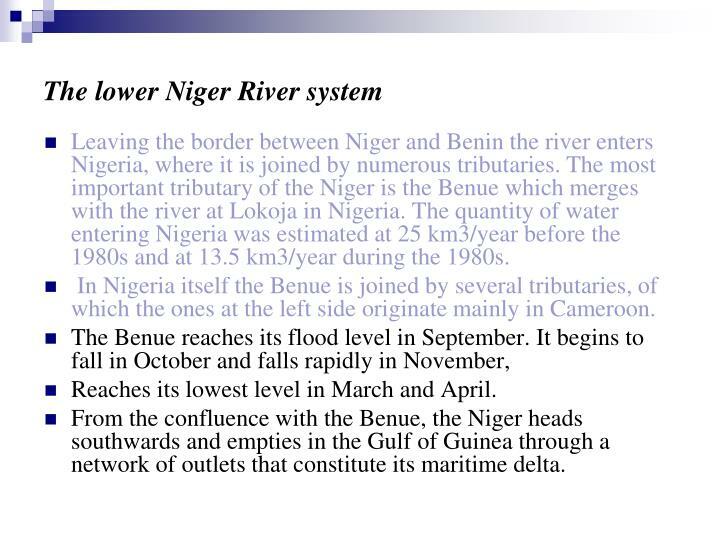 From the confluence with the Benue, the Niger heads southwards and empties in the Gulf of Guinea through a network of outlets that constitute its maritime delta. 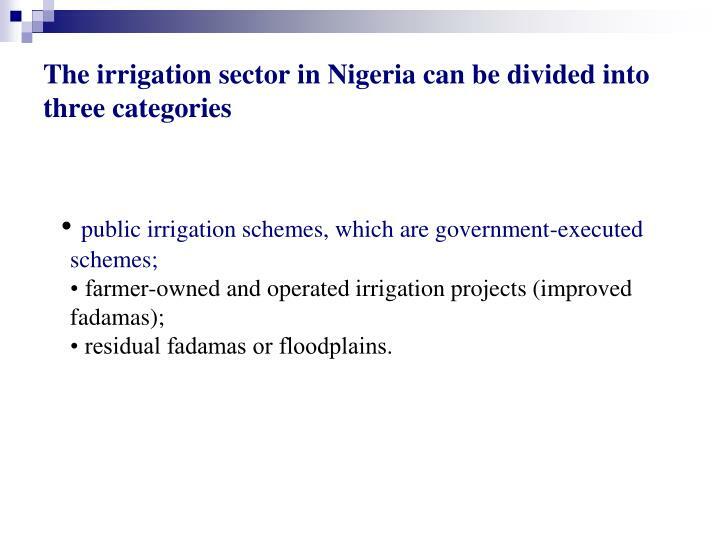 • public irrigation schemes, which are government-executed schemes;• farmer-owned and operated irrigation projects (improved fadamas);• residual fadamas or floodplains. and the south-eastern catchment basin. and Shasha which are sourced from the Yoruba highlands and drain the landmass in the south western part of Nigeria. These rivers empty into the Lagos lagoon. 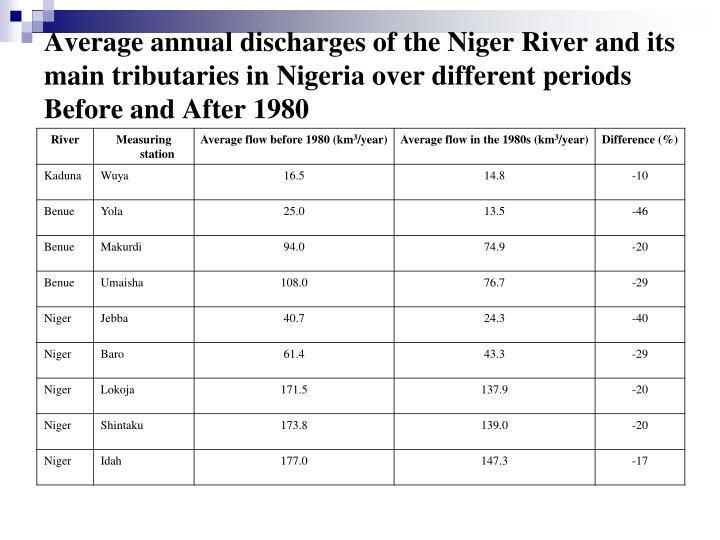 the Niger and Benue rivers. and has a total length of 4 123 km - making it the eleventh longest river in the world. Some 233 km below the Lokoja at Aboh, the Niger River starts to break up into tributaries to form a delta. 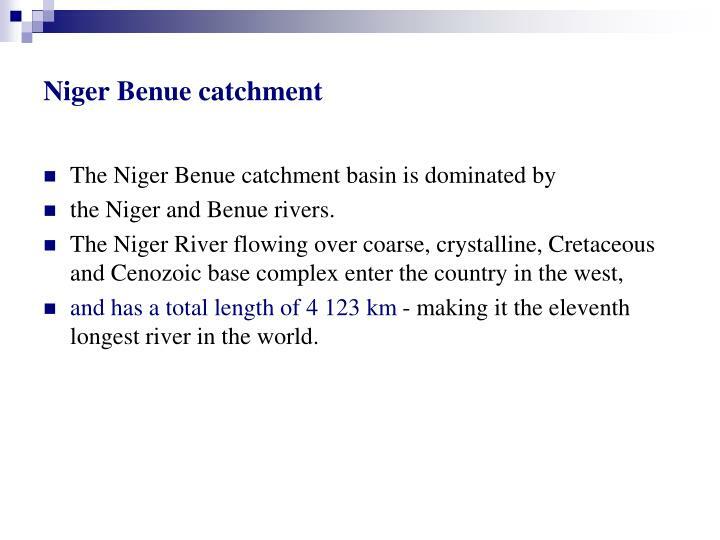 The Niger River drains a total area of 621,351 km2. NEDECO, (1961) estimated the annual discharge of freshwater to the delta to be 200 x 109 cubic metres, while total annual discharge has also been estimated to be about 300 x 109 cubic metres. several other smaller rivers which take their sources from the eastern highland south of the Benue River. These rivers empty into the ocean through estuaries. 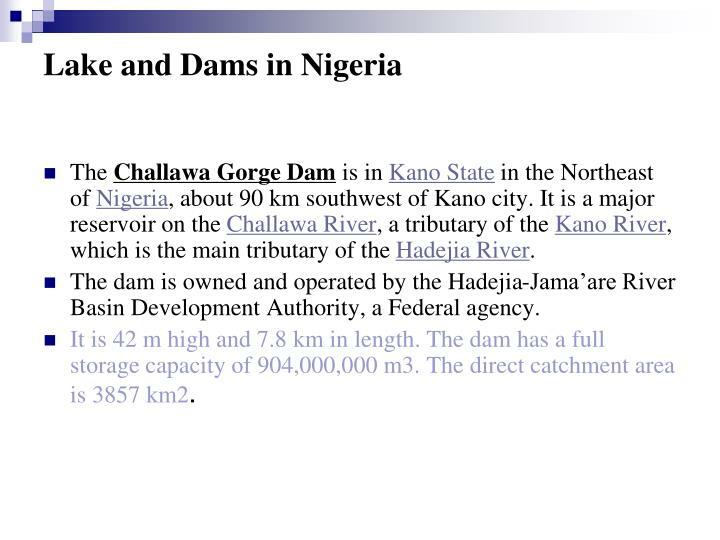 The Challawa Gorge Dam is in Kano State in the Northeast of Nigeria, about 90 km southwest of Kano city. It is a major reservoir on the Challawa River, a tributary of the Kano River, which is the main tributary of the Hadejia River. 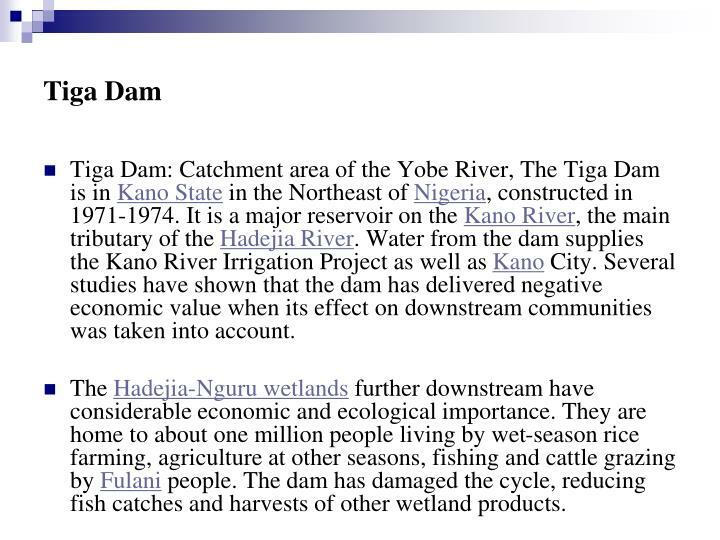 The dam is owned and operated by the Hadejia-Jama’are River Basin Development Authority, a Federal agency. It is 42 m high and 7.8 km in length. The dam has a full storage capacity of 904,000,000 m3. The direct catchment area is 3857 km2. 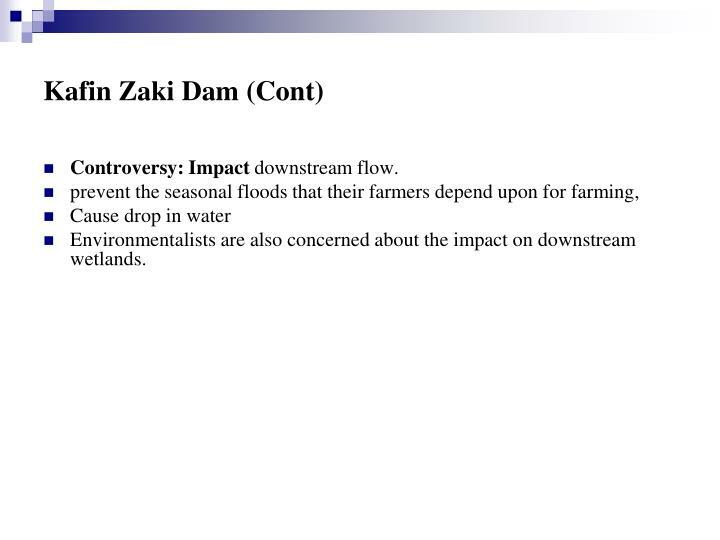 Disruption of the natural balance along the river. 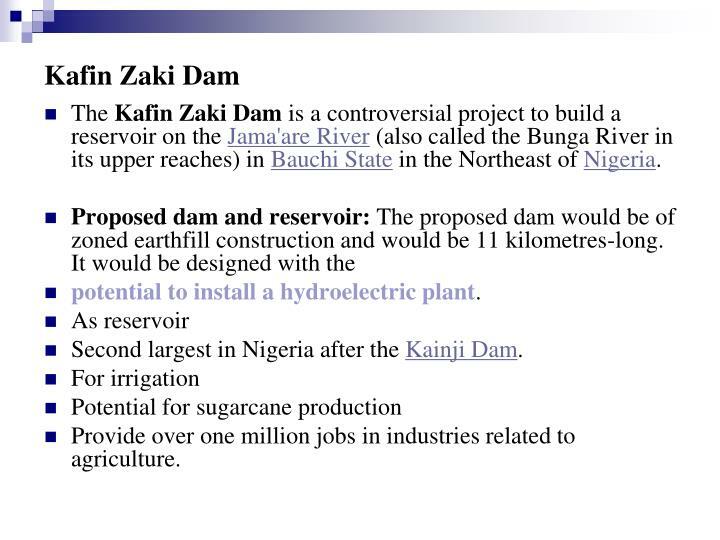 The Kafin Zaki Dam is a controversial project to build a reservoir on the Jama'are River (also called the Bunga River in its upper reaches) in Bauchi State in the Northeast of Nigeria. 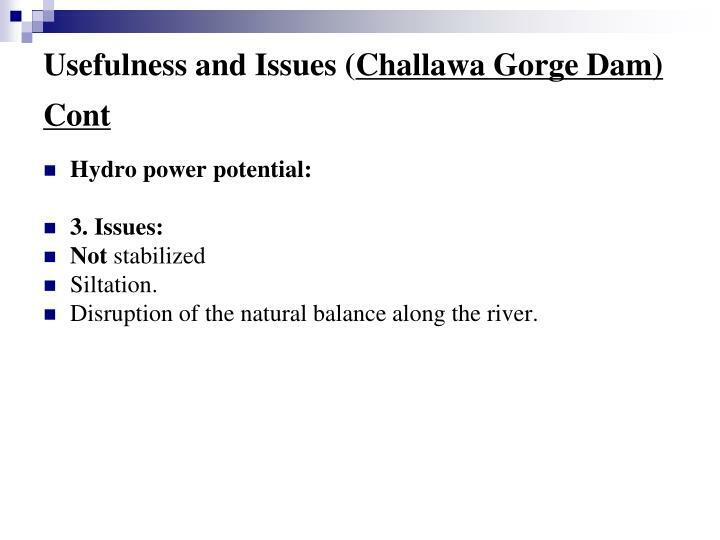 potential to install a hydroelectric plant. 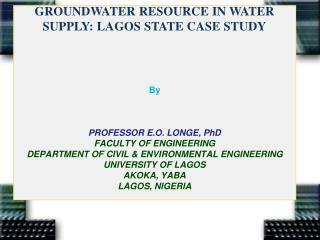 Second largest in Nigeria after the Kainji Dam. Provide over one million jobs in industries related to agriculture. Environmentalists are also concerned about the impact on downstream wetlands. 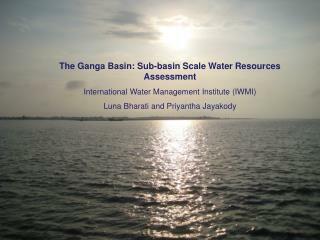 it is used extensively for fishing and irrigation. The lake completely submerged Foge Island in the Niger River, the town of Bussa, and other riverine settlements; part of the old town of Yelwa (the seat of Yauri emirate) was also permanently flooded. About 50,000 people—mostly Reshe (Gungunci, Gungawa), Busa (Busawa, Bussangi), Kamberi, Nupe, Lopawa, and Laro—were displaced. Construction of the dam began in 1964 and was completed in 1968.
with one-quarter of this amount used to resettle people displaced by the construction of the dam and its reservoir, Kainji Lake. 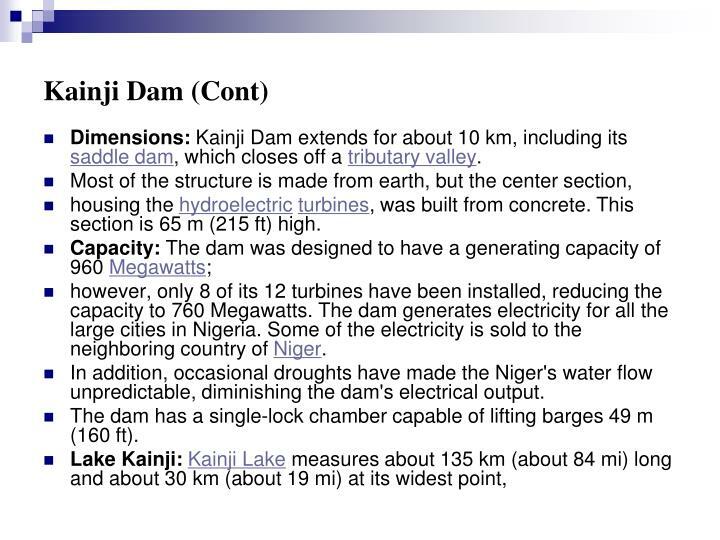 Dimensions: Kainji Dam extends for about 10 km, including its saddle dam, which closes off a tributary valley. housing the hydroelectricturbines, was built from concrete. This section is 65 m (215 ft) high. however, only 8 of its 12 turbines have been installed, reducing the capacity to 760 Megawatts. The dam generates electricity for all the large cities in Nigeria. 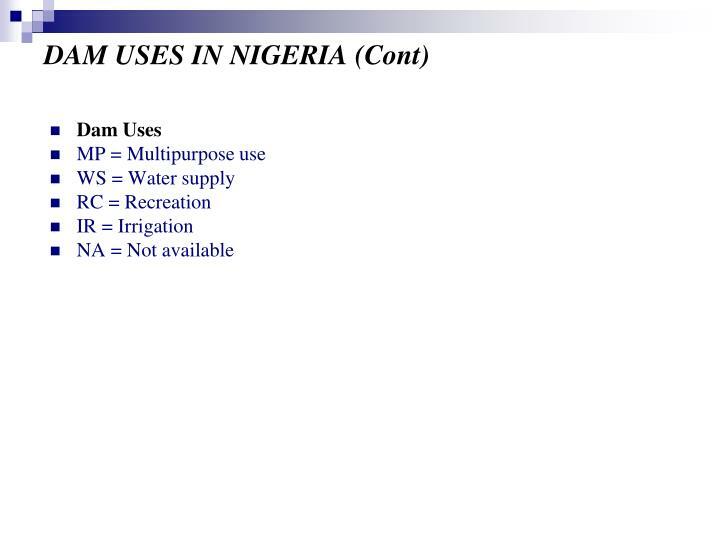 Some of the electricity is sold to the neighboring country of Niger. 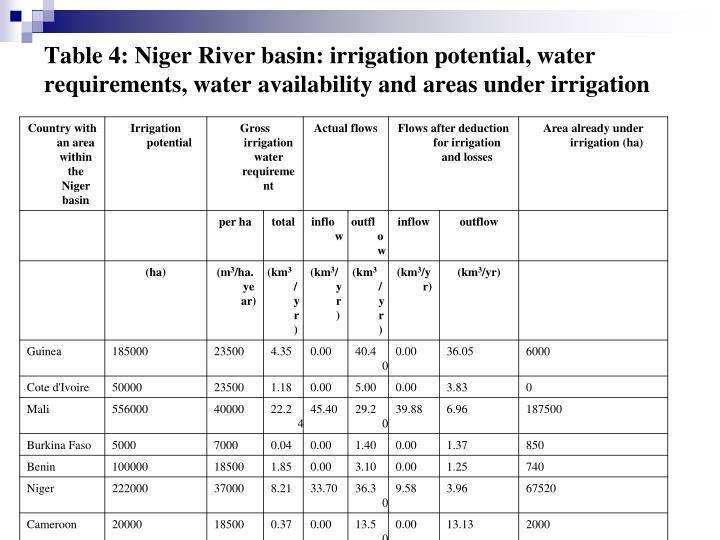 In addition, occasional droughts have made the Niger's water flow unpredictable, diminishing the dam's electrical output. The dam has a single-lock chamber capable of lifting barges 49 m (160 ft). 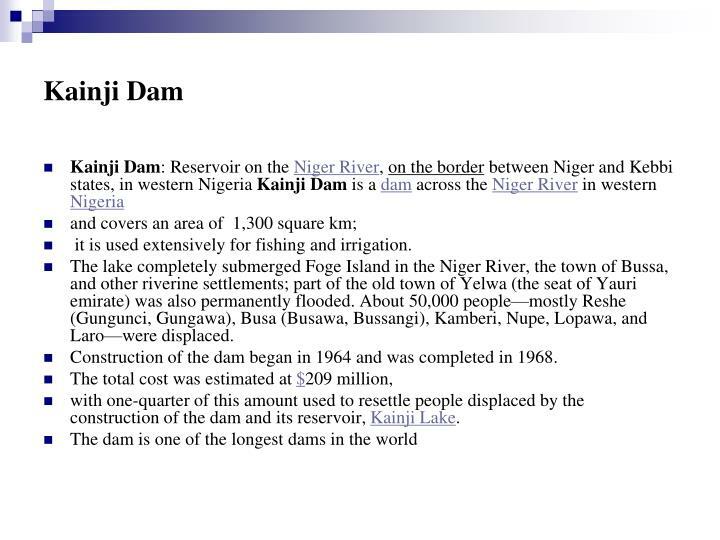 Tiga Dam: Catchment area of the Yobe River, The Tiga Dam is in Kano State in the Northeast of Nigeria, constructed in 1971-1974. It is a major reservoir on the Kano River, the main tributary of the Hadejia River. 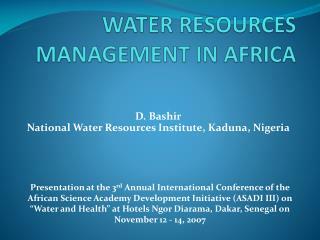 Water from the dam supplies the Kano River Irrigation Project as well as Kano City. 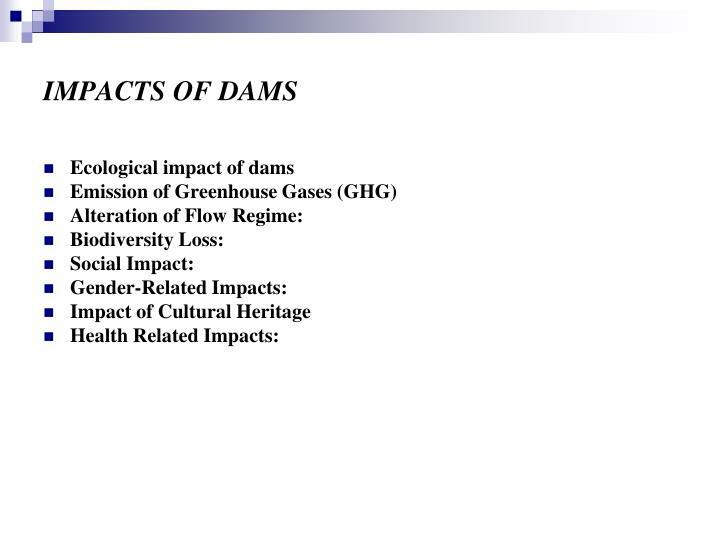 Several studies have shown that the dam has delivered negative economic value when its effect on downstream communities was taken into account. The Hadejia-Nguru wetlands further downstream have considerable economic and ecological importance. They are home to about one million people living by wet-season rice farming, agriculture at other seasons, fishing and cattle grazing by Fulani people. The dam has damaged the cycle, reducing fish catches and harvests of other wetland products. Shiroro Dam: Over 26 villages in Kede, Lakpma and Shiroro Local Government in Niger State were flooded by the waters from Rivers Niger and Kaduna in 2003. The flood displaced about 10,000 persons in Ketsho in Kede Local Government who were said to have moved to Kwara State, while other 13,500 person in Lakpam and Shiroro were rendered homeless. Obudu Dam: The Obudu Dam spillway was damaged by storm in July 2003 which resulted in fatal disaster that claimed over 200 houses, several farmlands, settlements and business concerns. Igabi Dam: Property worth about N500 million ($3.9m) were destroyed while thousands of people were rendered homeless in Kaduna State when River Kaduna overflowed its banks and submerged several streets and housing estates. 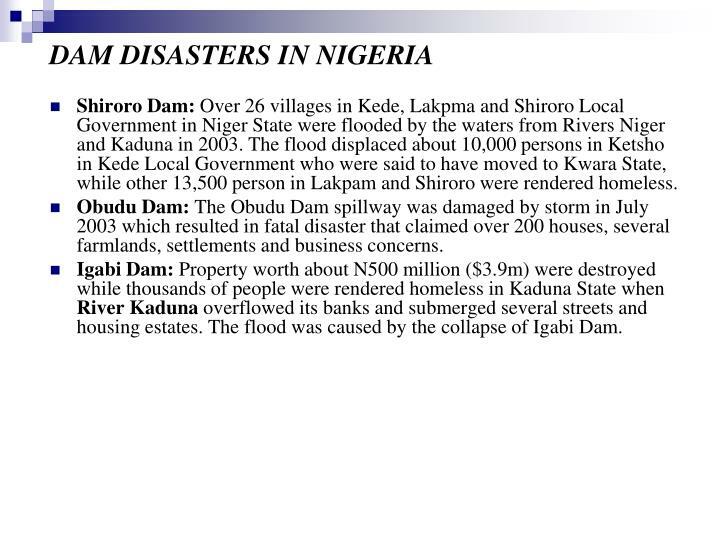 The flood was caused by the collapse of Igabi Dam. 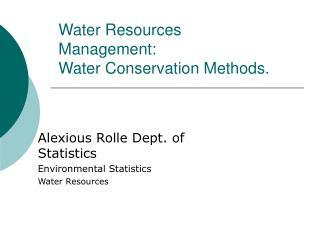 The availability of ground water for the development of any State or Community in the country depends on the hydrogeological characteristics of the underlying ground water province in the area. 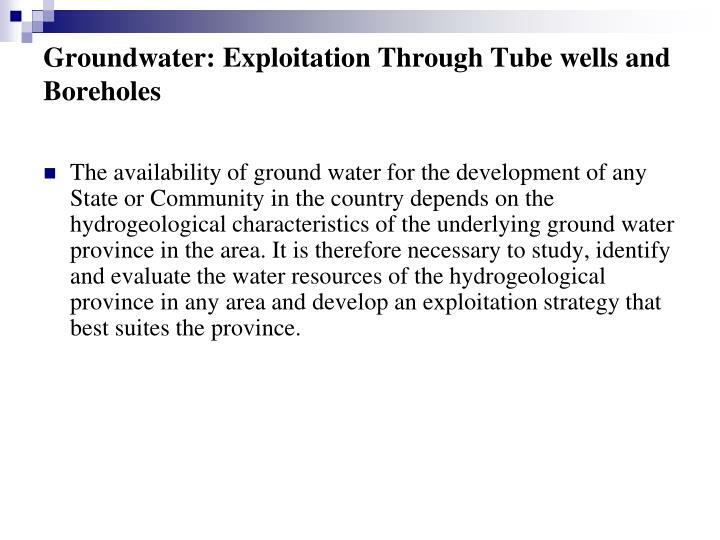 It is therefore necessary to study, identify and evaluate the water resources of the hydrogeological province in any area and develop an exploitation strategy that best suites the province. 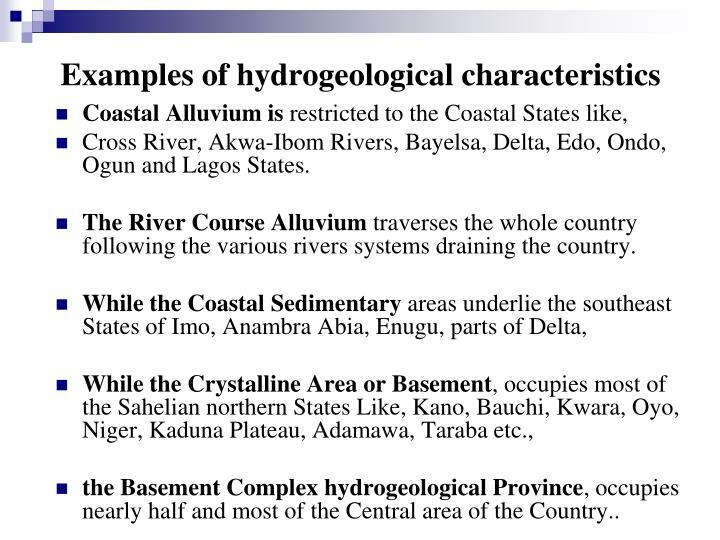 Cross River, Akwa-Ibom Rivers, Bayelsa, Delta, Edo, Ondo, Ogun and Lagos States. The River Course Alluvium traverses the whole country following the various rivers systems draining the country. the Basement Complex hydrogeological Province, occupies nearly half and most of the Central area of the Country.. 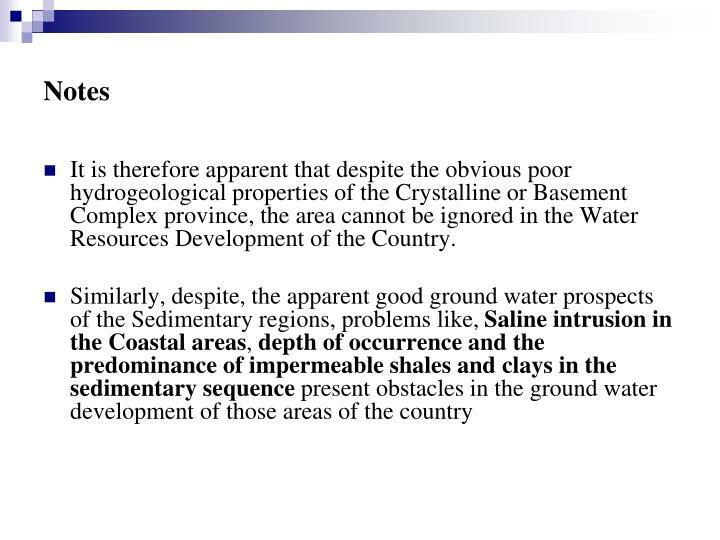 It is therefore apparent that despite the obvious poor hydrogeological properties of the Crystalline or Basement Complex province, the area cannot be ignored in the Water Resources Development of the Country. 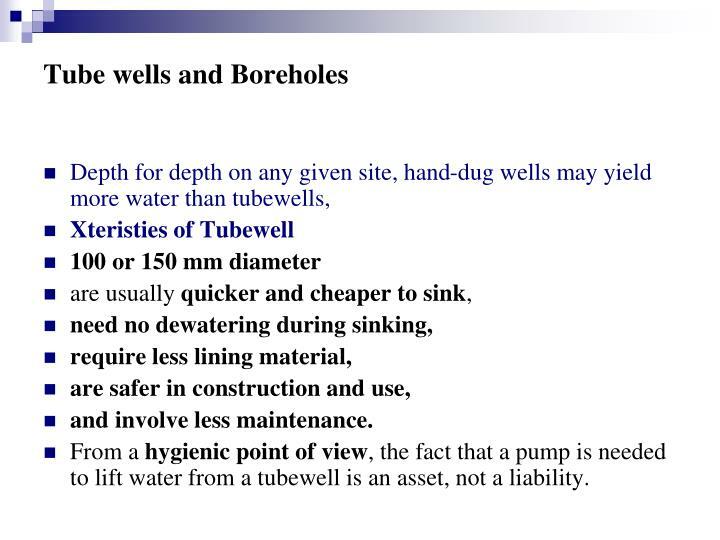 From a hygienic point of view, the fact that a pump is needed to lift water from a tubewell is an asset, not a liability. using only man-powered low-technology equipment, namely, hand auguring using a Vonder rig, and sludging. 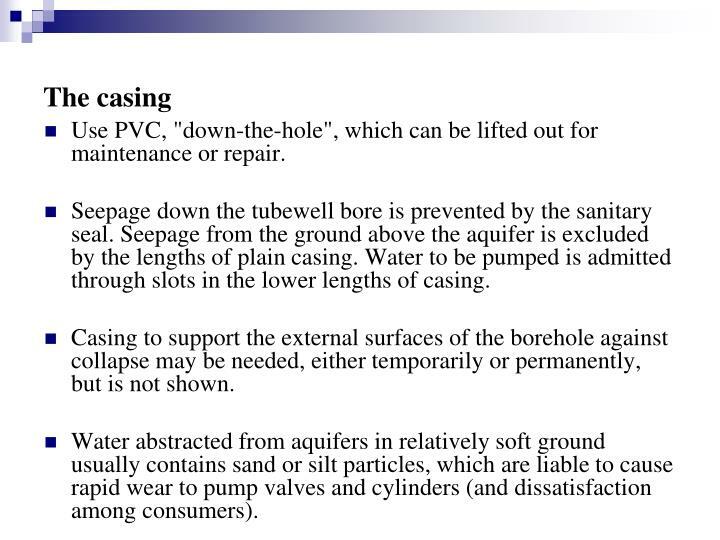 Use PVC, "down-the-hole", which can be lifted out for maintenance or repair. Seepage down the tubewell bore is prevented by the sanitary seal. 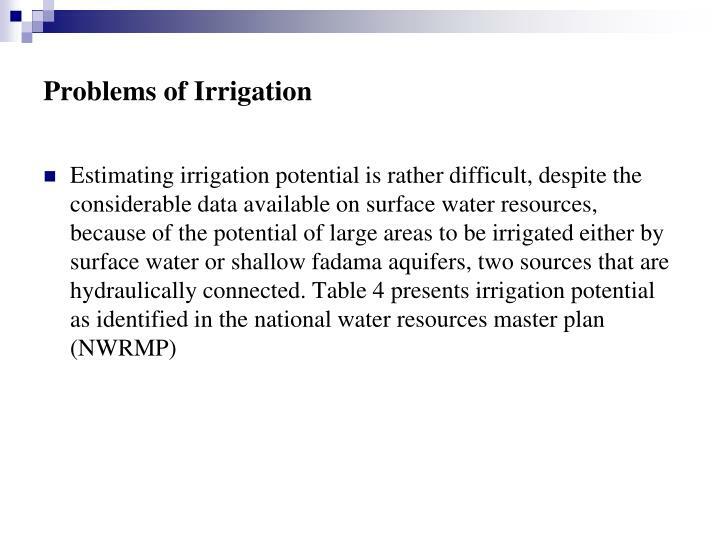 Seepage from the ground above the aquifer is excluded by the lengths of plain casing. Water to be pumped is admitted through slots in the lower lengths of casing. 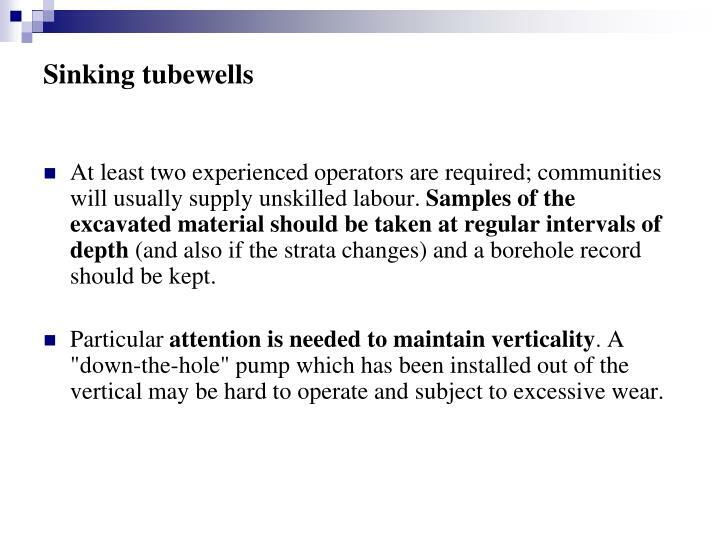 Casing to support the external surfaces of the borehole against collapse may be needed, either temporarily or permanently, but is not shown. 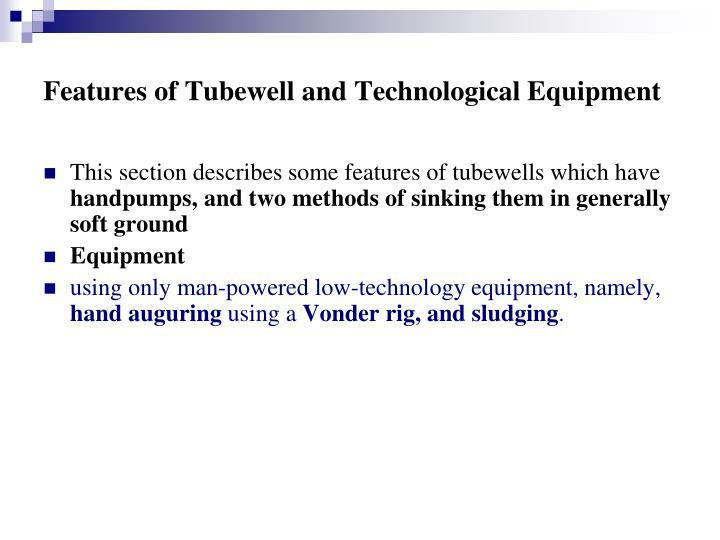 Water abstracted from aquifers in relatively soft ground usually contains sand or silt particles, which are liable to cause rapid wear to pump valves and cylinders (and dissatisfaction among consumers). 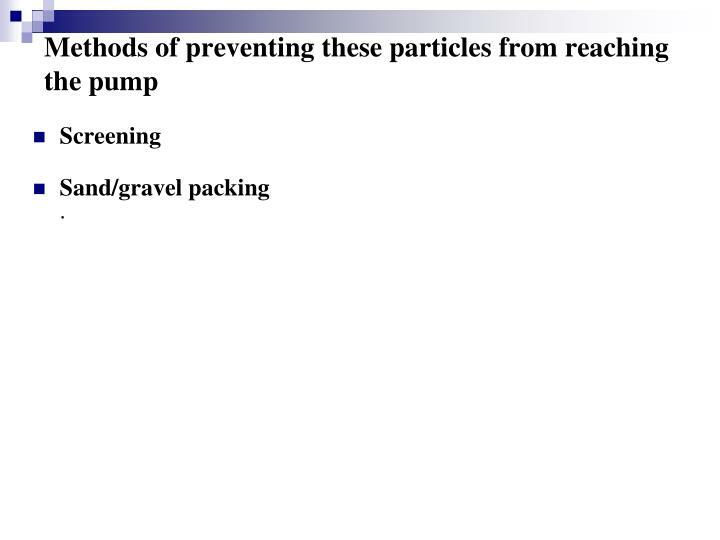 Over-pumping (that is, pumping at above the design-rate) before the well enters service can improve the efficiency of the packing by drawing further fine particles into it. Where the surrounding ground has many fine particles, the flow of water can be accelerated by back-flushing at a higher rate. 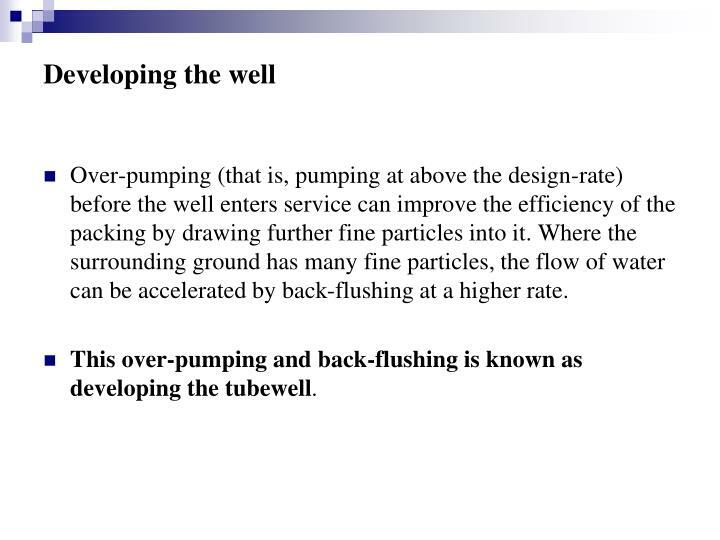 This over-pumping and back-flushing is known as developing the tubewell. At least two experienced operators are required; communities will usually supply unskilled labour. 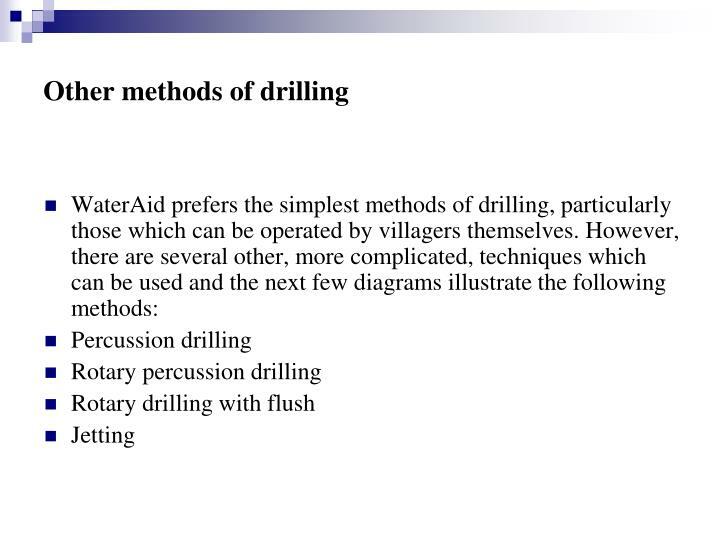 Samples of the excavated material should be taken at regular intervals of depth (and also if the strata changes) and a borehole record should be kept. Particular attention is needed to maintain verticality. A "down-the-hole" pump which has been installed out of the vertical may be hard to operate and subject to excessive wear. 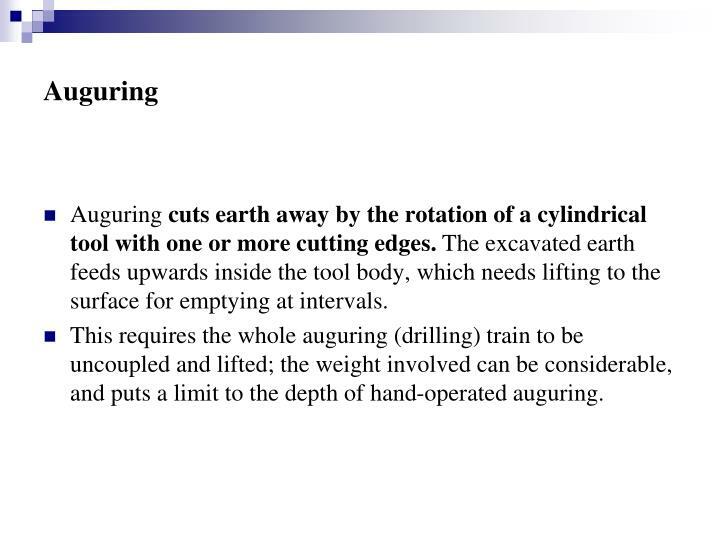 Auguring cuts earth away by the rotation of a cylindrical tool with one or more cutting edges. The excavated earth feeds upwards inside the tool body, which needs lifting to the surface for emptying at intervals. This requires the whole auguring (drilling) train to be uncoupled and lifted; the weight involved can be considerable, and puts a limit to the depth of hand-operated auguring. 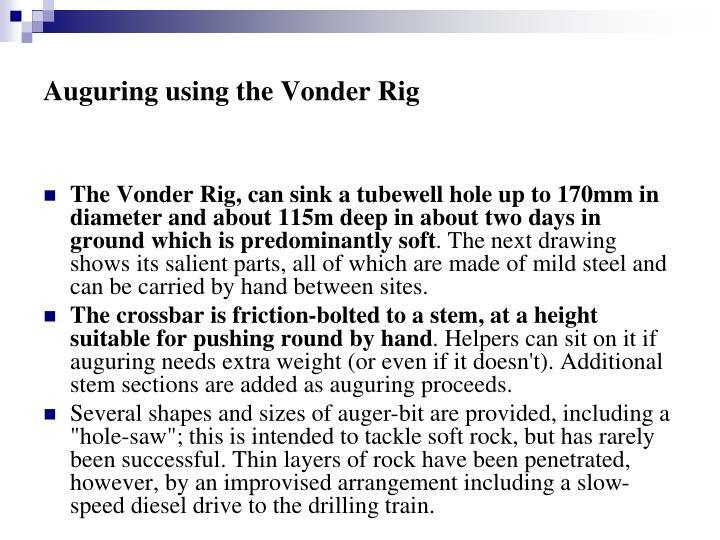 The Vonder Rig, can sink a tubewell hole up to 170mm in diameter and about 115m deep in about two days in ground which is predominantly soft. The next drawing shows its salient parts, all of which are made of mild steel and can be carried by hand between sites. The crossbar is friction-bolted to a stem, at a height suitable for pushing round by hand. Helpers can sit on it if auguring needs extra weight (or even if it doesn't). Additional stem sections are added as auguring proceeds. Several shapes and sizes of auger-bit are provided, including a "hole-saw"; this is intended to tackle soft rock, but has rarely been successful. Thin layers of rock have been penetrated, however, by an improvised arrangement including a slow-speed diesel drive to the drilling train. 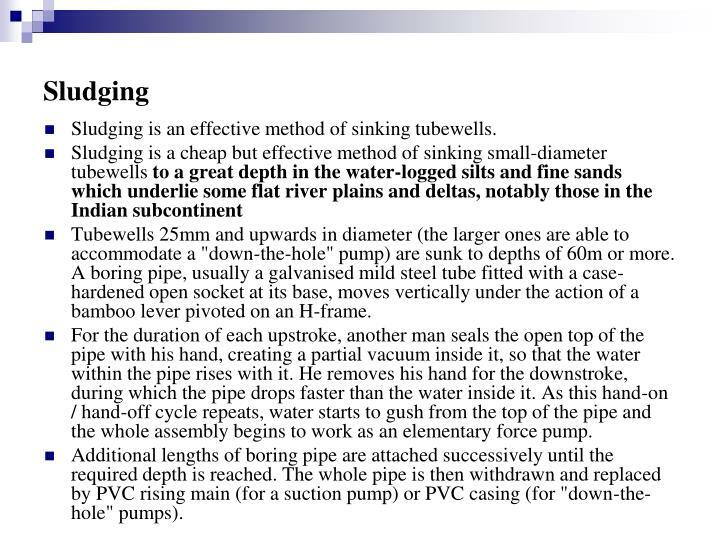 Sludging is an effective method of sinking tubewells. Tubewells 25mm and upwards in diameter (the larger ones are able to accommodate a "down-the-hole" pump) are sunk to depths of 60m or more. A boring pipe, usually a galvanised mild steel tube fitted with a case-hardened open socket at its base, moves vertically under the action of a bamboo lever pivoted on an H-frame. For the duration of each upstroke, another man seals the open top of the pipe with his hand, creating a partial vacuum inside it, so that the water within the pipe rises with it. He removes his hand for the downstroke, during which the pipe drops faster than the water inside it. As this hand-on / hand-off cycle repeats, water starts to gush from the top of the pipe and the whole assembly begins to work as an elementary force pump. Additional lengths of boring pipe are attached successively until the required depth is reached. The whole pipe is then withdrawn and replaced by PVC rising main (for a suction pump) or PVC casing (for "down-the-hole" pumps). 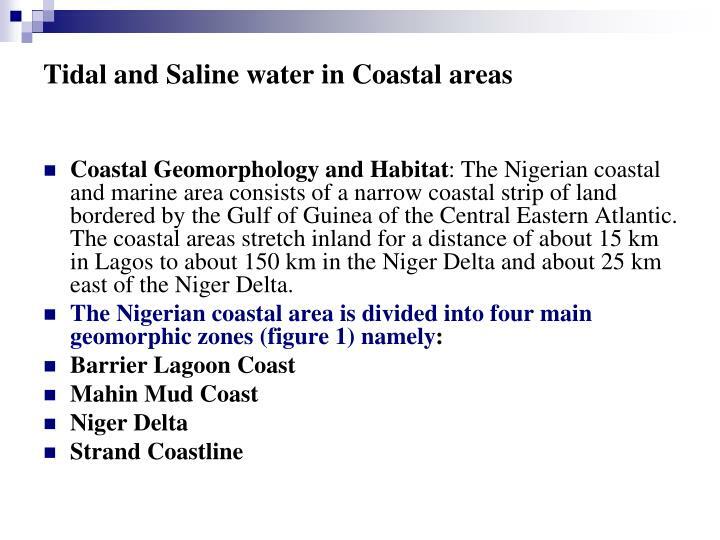 Coastal Geomorphology and Habitat: The Nigerian coastal and marine area consists of a narrow coastal strip of land bordered by the Gulf of Guinea of the Central Eastern Atlantic. The coastal areas stretch inland for a distance of about 15 km in Lagos to about 150 km in the Niger Delta and about 25 km east of the Niger Delta. 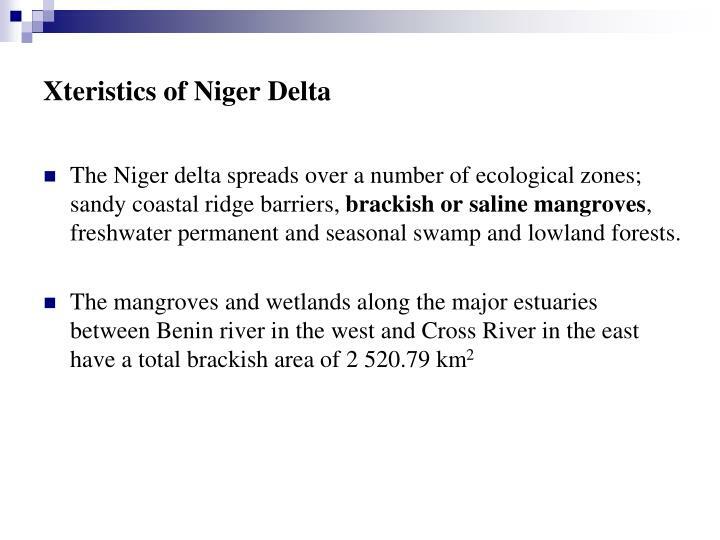 The Niger delta spreads over a number of ecological zones; sandy coastal ridge barriers, brackish or saline mangroves, freshwater permanent and seasonal swamp and lowland forests. 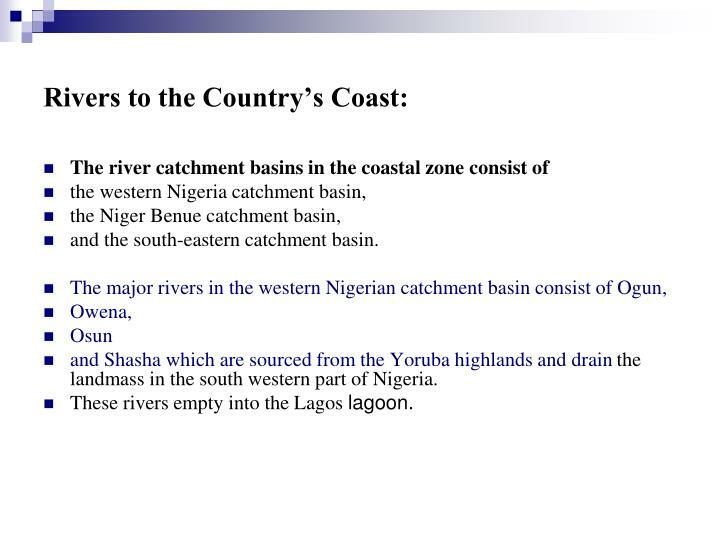 The Nigerian coast and marine areas are influenced by tides, waves, long shore currents, and ocean currents. Tides along the entire Nigerian coast are semi diurnal with two tides arrive in a south westerly direction. 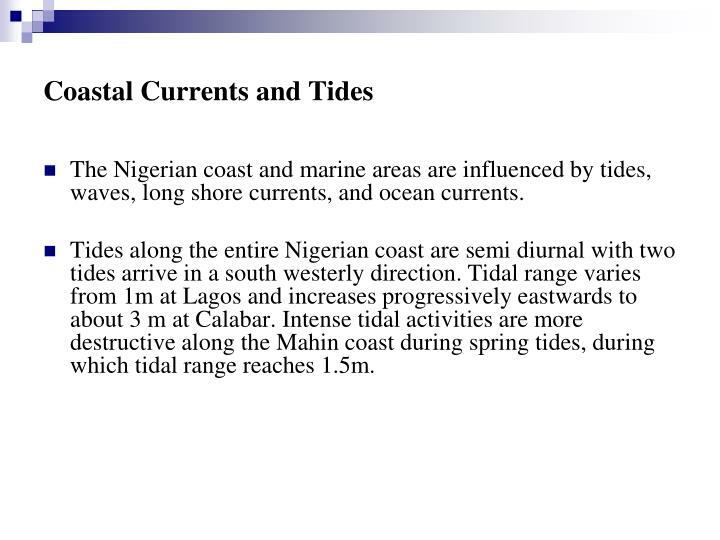 Tidal range varies from 1m at Lagos and increases progressively eastwards to about 3 m at Calabar. Intense tidal activities are more destructive along the Mahin coast during spring tides, during which tidal range reaches 1.5m. 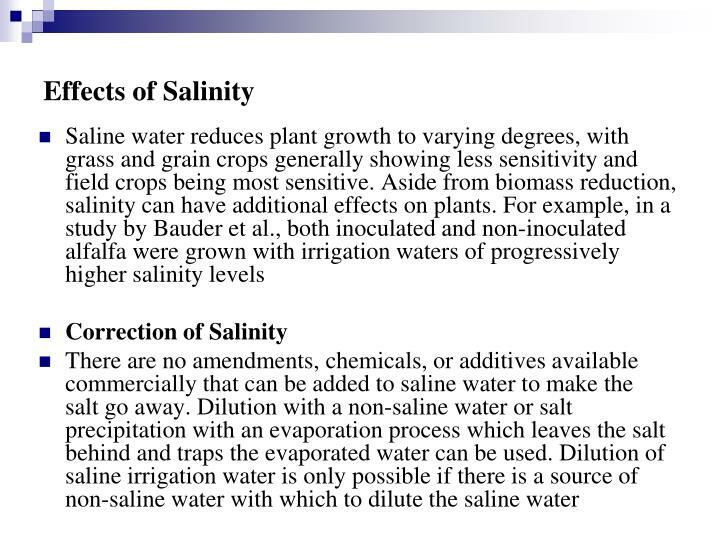 Water is classified as "saline" when it becomes a risk for growth and yield of crops. 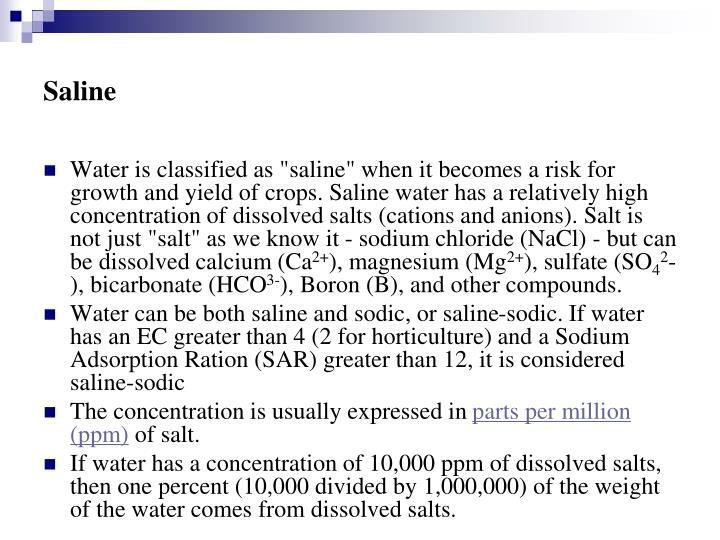 Saline water has a relatively high concentration of dissolved salts (cations and anions). Salt is not just "salt" as we know it - sodium chloride (NaCl) - but can be dissolved calcium (Ca2+), magnesium (Mg2+), sulfate (SO42-), bicarbonate (HCO3-), Boron (B), and other compounds. The concentration is usually expressed in parts per million (ppm) of salt. If water has a concentration of 10,000 ppm of dissolved salts, then one percent (10,000 divided by 1,000,000) of the weight of the water comes from dissolved salts. 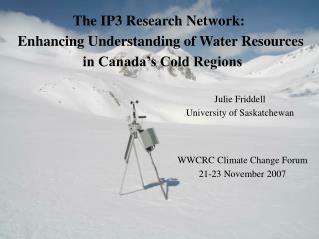 Slightly saline water contains around 1,000 to 3,000 ppm. 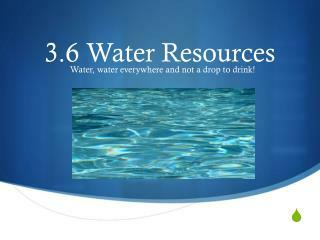 Moderately saline water contains roughly 3,000 to 10,000 ppm. Highly saline water has around 10,000 to 35,000 ppm of salt. 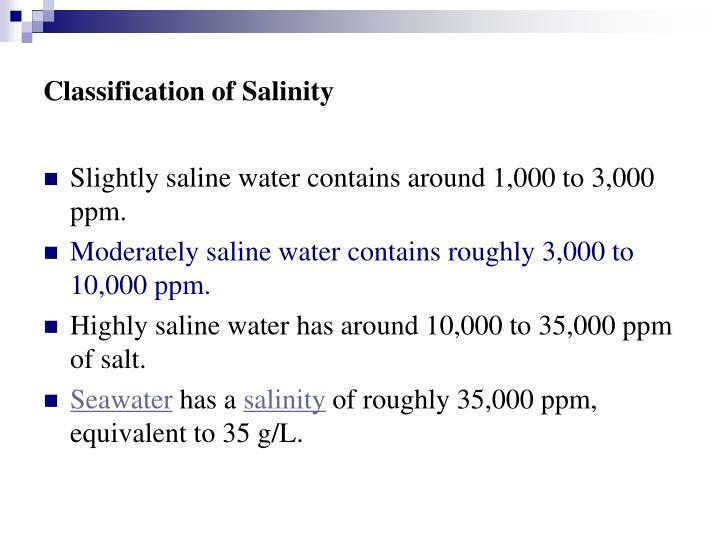 Seawater has a salinity of roughly 35,000 ppm, equivalent to 35 g/L. 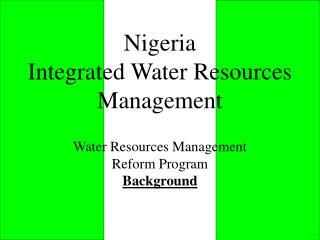 Nigeria Integrated Water Resources Management -. 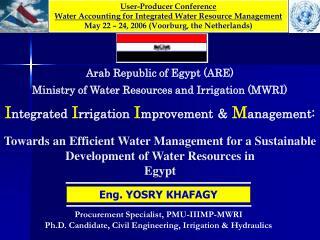 water resources management reform program background. 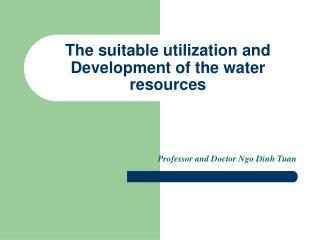 The suitable utilization and Development of the water resources -. professor and doctor ngo dinh tuan. 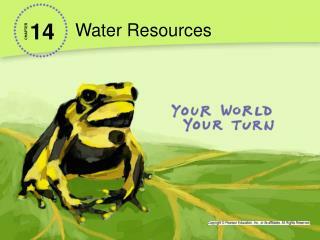 Water Resources -. 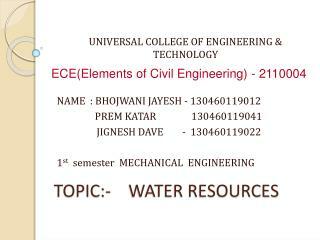 access to water. health issues lack of water = leading cause of illness economic issues decrease poverty, production of food &amp; energy women/children issues in developing countries, responsible. 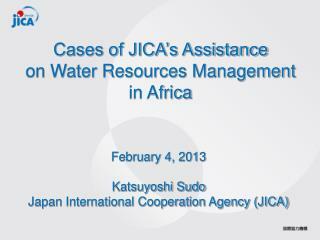 access to water. 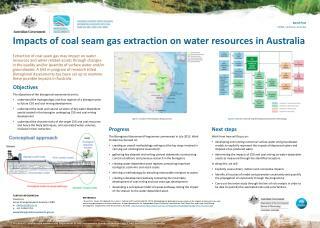 Impacts of Gas Drilling on Water Resources -. susan riha director, nys water resources institute. outline. 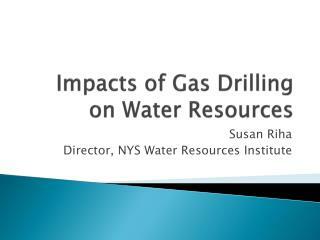 impacts on gas well drilling on water resources gas wells in new york and the marcellus shale regulatoryissues larger context. 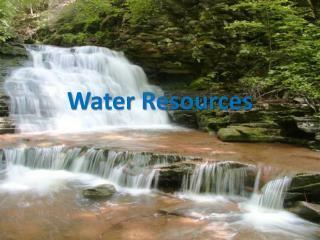 Water Resources -. 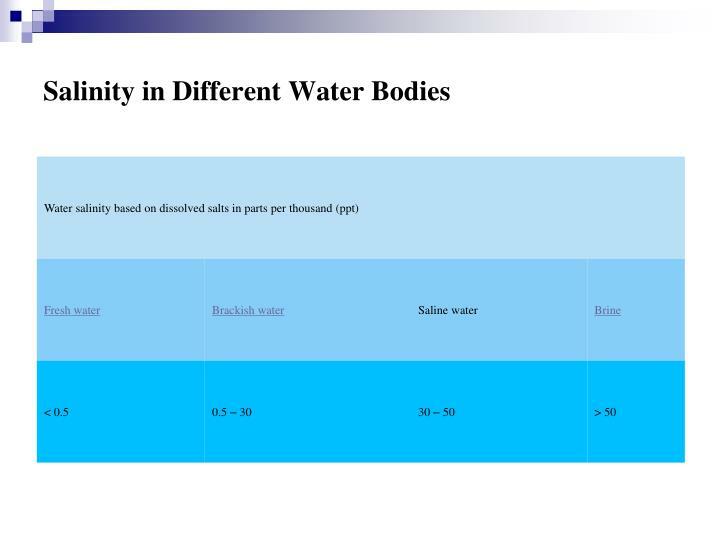 types of water. 71% of earth is covered in water salt water – 97% of the earth’s water fresh water – 3% of the earth’s water 77% is frozen surface water – lakes, rivers, streams, wetlands. river systems.